This component provides sound support. AudioClip defines a sound file and allows to start and stop playback. 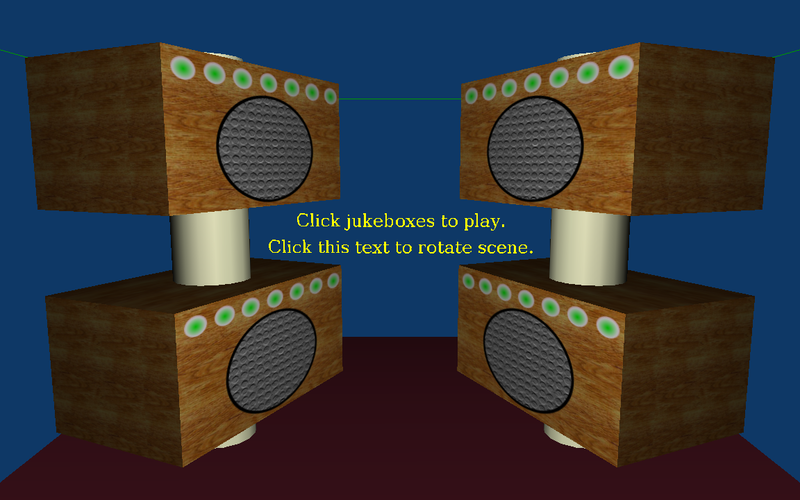 Sound positions the sound in 3D world and configures sound parameters. Sounds may be spatialized (3D) or not. See also X3D specification of the Sound component. For demos and tests of these features, see the sound subdirectory inside our VRML/X3D demo models. AudioClip node is a buffer for sound data. Basically, it's a wrapper around a sound data coming from .wav, .ogg and such files. Sound node is a 3D sound, that has a 3D position, can move (by animating Sound.location and the parent transformation). Naturally Sound references AudioClip by Sound.source field. spatialize. Note that multi-channel (e.g. stereo) sound files are never spatialized. Be sure to convert your sound files to mono if you want to use them for 3D spatialized sound. minFront and maxFront values are handled. Our sound attenuation model is a little simpler than VRML/X3D requirements. We have an inner sphere, of radius minFront, where sound gain is at maximum. And we have an outer sphere, of radius maxFront, where sound gain drops to zero. Between them sound gain drops linearly. Contrast this with VRML/X3D spec, that requires two ellipsoids (not just spheres). In our implementation, the sounds at your back are attenuated just the same as the front sounds. We simply ignore direction, minBack and maxBack fields. As far as I know, the ellipsoids model is not possible in OpenAL, so we're probably not the only viewer that doesn't support them. It's unclear from the specification whether playing should be limited only to the sounds in the active graph part (the subset of children chosen in LOD / Switch and similar nodes). To be on the safe side, always place your sounds in the active graph part, although our implementation will usually also play sounds in the inactive part (exceptions may happen for complicated situations with PROTOs). Reports how other browsers handle this are welcome. Right now, sounds are not sorted exactly like the specification says. In short, we only look at your given "priority" field, disregarding current sound distance to player and such. This will definitely by fixed some day, please speak up on forum if you need it. url (allowed sound file formats are OggVorbis and (uncompressed) WAV). all time-dependent fields (start/stop/pause/resumeTime, elapsedTime, isActive, isPaused). TODO: But we don't really control our position (offset) within the sound. When we detect that we should be playing, but we're not — we just start playing, always from the beginning. TODO: There's no streaming implemented yet. So too many and too long music files in one world may cause large memory consumption, and at the first play of a long sound there may be a noticeable loading delay. TODO: Only AudioClip works as sound source for now. You cannot use MovieTexture as sound source. VRML/X3D define the play/stop events at the AudioClip node (not at higher-level Sound node, which would be more useful IMO). This means that USEing many times the same AudioClip or Sound nodes doesn't make much sense. You can only achieve the same sound, playing simultaneously the same thing, from multiple 3D sources. Since such simultaneous sounds are usually useless, we don't even implement them (so don't reUSE AudioClip or Sound nodes, or an arbitrary one will be playing). If you want to use the same sound file many times, you will usually want to just add many AudioClip nodes, and set their url field to the same value. Our implementation is optimized for this case, we have an internal cache that will actually load the sound file only once, even when it's referenced by many AudioClip.url values. The question is: where do we put start/stop events. At the Sound node, or at the AudioClip node? More precisely, which node has X3DTimeDependentNode as an ancestor (X3DTimeDependentNode contains startTime, stopTime and a lot of other playing-related fields and events). The decision of X3D specificaion was to put them at AudioClip. So you need two AudioClip nodes, even though their contents are equal. The upside of X3D specification is that this way MovieTexture, which also descends from X3DTimeDependentNode, can be used inside Sound nodes. This way you can play audio track from movies. and independently start/stop playing sounds S1 and S2. Probably, the idea of playing sounds from MovieTexture should be just dropped in this case, otherwise it gets messy. Personally, Michalis would choose the option 2. (But it's too late for that now, and we implement spec-complaint decision 1.) I don't think that playing audio tracks from movie files is a useful or common use case. It's wasteful, anyway, to reference a movie just to play an audio track, so authors are well adviced to avoid this. If you want to play an audio track from a movie, consider just extracting the audio track to a separate .wav/.ogg file and playing it using AudioClip node. This way we will not have to download the whole movie just to play its audio.